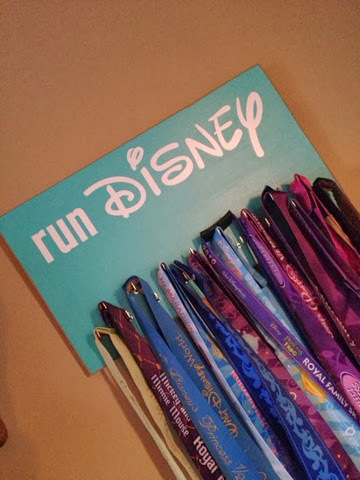 BamagirlRUNS: My runDisney Medals Have A Home! I am proud to announce that I am now "officially" an owner of a medal rack! I am almost, not totally, but almost embarrassed to admit that I keep my medals stuffed in two Lululemon shopping bags. I know. Hard to believe, right?? For years now, I have debated on which kind of rack to get. So many options, so many colors, so many designs..ugh. I'm NO good at making decisions. I've had my eye on this little beauty for a while now and I'm absolutely in love with it. 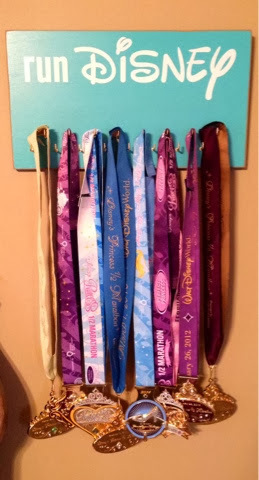 This medal rack comes from the company RUNNING on the wall and there are so many cute Disney-Inspired themes and options. 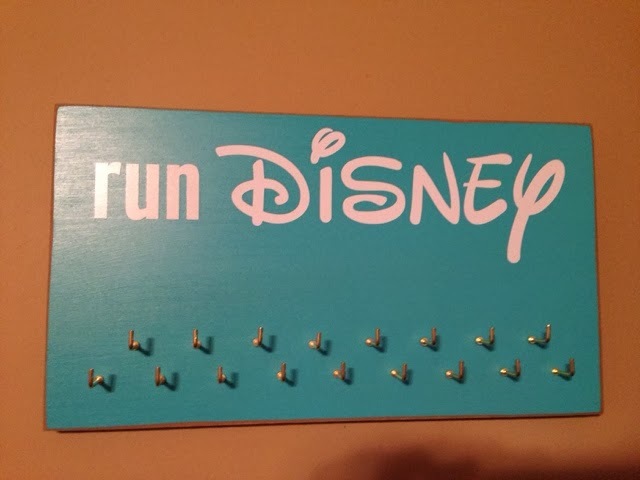 I chose a turquoise color along with a simple runDisney design. I wanted to hang just a few of my medals on it...I thought this rack would be a good fit for my Princess bling! I wanted a design that was simple, made of sturdy material, did not look "cheap" and fit in nicely with the decor of my home. It is going on the walls for everyone to see in home, afterall! One of my favorite touches on this rack is that the plaque is made from a simulated wood with a hand-painted distressed look. Love! Some of the other options that I thought were nice on the RUNNING on the wall website were racks that included places for photos and bibs to be displayed as well. I was able to hang all six of my Princess Half Marathon, Glass Slipper and Enchanted 10K medals nicely! 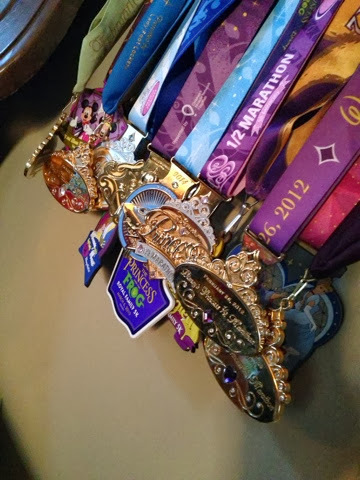 This is all of my Princess Weekend Medals including the 5K's! **For these great medal displays and others, be sure to check out RUNNINGonthewall.com and to learn how to earn your very own runDisney bling, please check out runDisney.com! How do you display your bling? Disclaimer: I was provided a complimentary medal rack in exchange for my opinions regarding this product. All opinions are my own.